Oprah Winfrey is "actively thinking" about running for president, two of her close friends told CNN Monday. 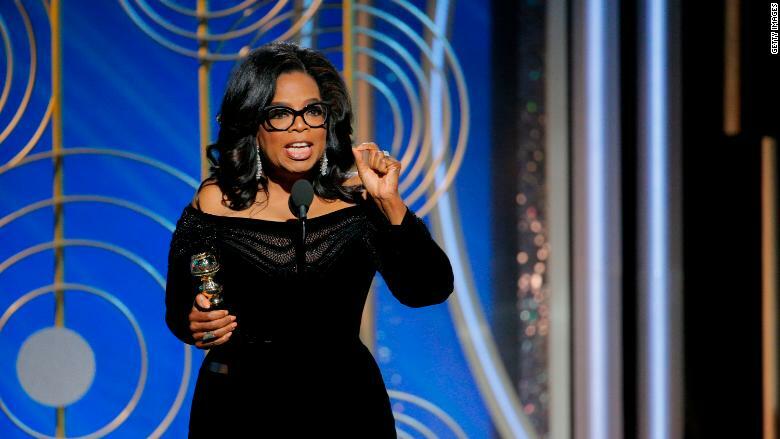 The two friends, who requested anonymity in order to speak freely, talked in the wake of Winfrey's extraordinary speech at the Golden Globes Sunday night, which spurred chatter about a 2020 run. A representative for Winfrey has not responded to requests for comment. The Democratic race for president won't officially begin until after the 2018 midterms, but many potential candidates are already jostling for position and making trips to Iowa. "President Winfrey" was the talk of the entertainment world after Winfrey accepted the Cecil B. DeMille Award at the Golden Globes. And the "Oprah for president?" possibility was a top story on morning TV. The touchstone of her speech was the #MeToo movement. But her hopeful message -- "A new day is on the horizon" -- could have doubled as a campaign rallying cry. Many liberal-leaning celebrities and viewers certainly heard it that way. And that may have been exactly what Winfrey wanted. As some political strategists have pointed out in the past year, her fame and wealth could make her a formidable Democratic Party candidate. But insiders have their doubts too: Would Americans really choose a TV star as president twice in a row? For now, it's all just talk. But her fans demonstrated a lot of wishful thinking on Twitter and Facebook after her speech. Winfrey has deflected questions about a presidential run in the past, but she has also acknowledged that President Trump's election upended assumptions about how to pursue political office. After the speech, Winfrey's longtime partner Stedman Graham was quoted saying a run is a possibility. "It's up to the people," Graham told a Los Angeles Times reporter. "She would absolutely do it." Winfrey campaigned for Barack Obama in 2008 and endorsed Hillary Clinton in 2016. During Clinton's campaign, she discussed the prospect of a female president and said "America, it's about time that we made that decision." She said it would be a "seminal moment for women." But the moment has yet to happen -- which is one of the reasons Sunday's speech stirred so much attention. Winfrey has deep pockets, an even deeper well of charisma, and instant name recognition, thanks to decades on "The Oprah Winfrey Show." Reese Witherspoon alluded to her friend's superstar status while introducing her at the Globes: "There's only one person whose name is a verb, an adjective, and a feeling. And that is Oprah." What she lacks is political experience. In an interview with Winfrey on Bloomberg last March, interviewer David Rubenstein broached the possibility, saying "It's clear you don't need government experience to be elected president of the United States." She indicated that the same thought had crossed her mind after Trump's election: "I thought, 'Oh gee, I don't have the experience, I don't know enough.' And now I'm thinking, 'Oh. Oh!'" Winfrey laughed while the studio audience applauded. For political advice, she could call the Obamas. Winfrey vacationed with the couple in Tahiti last spring. When interviewed, Winfrey sometimes stokes 2020 speculation, but other times she shoots down the idea. When her best friend Gayle King brought up the idea on "CBS This Morning" last October, Winfrey dismissed it: "There will be no running for office of any kind for me." Right now Winfrey has multiple jobs. She's the CEO of the cable channel OWN, a "special correspondent" for the CBS newsmagazine "60 Minutes" and an investor in companies like Weight Watchers. Her role at CBS News would conflict with any serious exploration of a presidential run. A CBS News spokeswoman declined to comment on Monday. Winfrey recently sold part of her stake in OWN but renewed her contract to remain CEO through 2025. It would be relatively easy to step aside from OWN for a presidential campaign. The political back-and-forth has already begun. On Sunday night Winfrey's detractors immediately began circulating an old photo of Winfrey with Harvey Weinstein, the disgraced movie mogul who has become the symbol of Hollywood rot. But her fans portrayed her as the perfect anti-Trump candidate -- that is, if she's willing to run. Videos and transcripts of the speech were widely shared on social media on Monday morning. The Washington Post quoted Meryl Streep saying that Winfrey "launched a rocket" with the speech. "I want her to run for president," Streep told The Post. "I don't think she had any intention [of declaring]. But now she doesn't have a choice." Earlier in the evening, Globes host Seth Meyers actually teed up the speculation. "Oprah," Meyers said, looking out at her in the audience, "in 2011, I told some jokes about our current president at the White House Correspondents Dinner -- jokes about how he was unqualified to be president -- and some have said that night convinced him to run. So if that's true, I just want to say: Oprah, you will never be president! You do not have what it takes!" The laughs and cheers from the crowd made it clear: Winfrey would have a lot of supporters in the entertainment industry. "The Late Show with Stephen Colbert" even tweeted out a mock campaign poster on Monday morning. The title: "HOPE-RAH." From "The Oprah Winfrey Show" to her films and book club selections, Winfrey has promoted inspiration and unity. In fact, that's been the focus of her occasional "60 Minutes" segments. Her first story was a focus group with both Trump and Clinton voters. Winfrey asked them: "By the time of the next presidential election, are we more likely to have come together? Will we have sought common ground?"